"How Can You Cure Your Depression?" Imagine you one day sending me an email testimonial like the ones above! :D Imagine yourself experiencing joy and freedom like my other readers. Come on and join them! 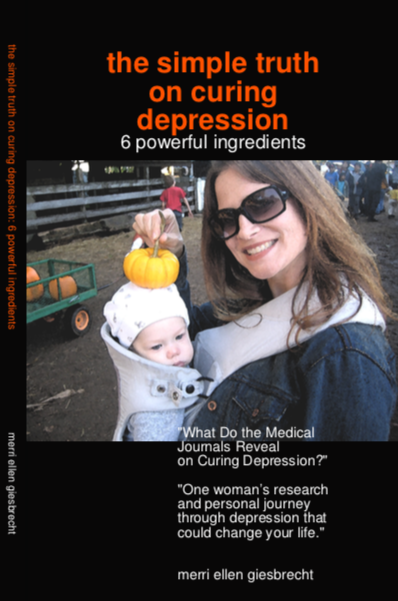 I'm pleased to present my complete downloadable handbook called The Simple Truth on Curing Depression: What Do The Medical Journals Reveal On Curing Depression? You will find the book to be a new lease on life as it has with other readers. It's all my research that I applied to beat depression and get out of the dark tunnel. I continue to daily use every tip covered in the book and have been depression free since 2002. >>Download the handbook here. The instructions are spelled out in plain English so you can start today. This book and website is a labour of love to further spread hope. I absolutely enjoy hearing of lives being changed all over the world! Thanks for your part in passing on some hope and taking a bit of hope yourself. Simply take this research and use it as a resource tool to ask your doctor the tough questions. That's what I did! I took this info and showed it to my doctor. Then with his permission, he guided me through it and it worked! This is yours to enjoy and to use as your motivator each day when you log on to your computer. Simply save it to your desk top. Because it's instantly downloadable you don't have to waste precious time waiting for it in the mail. Thank you in advance for investing in your health and future! P.S. Come join the thousands in now over 120 countries to date who have applied this research to beat their depression. Download the handbook here. The instructions are spelled out in plain English so you can start today >>>.